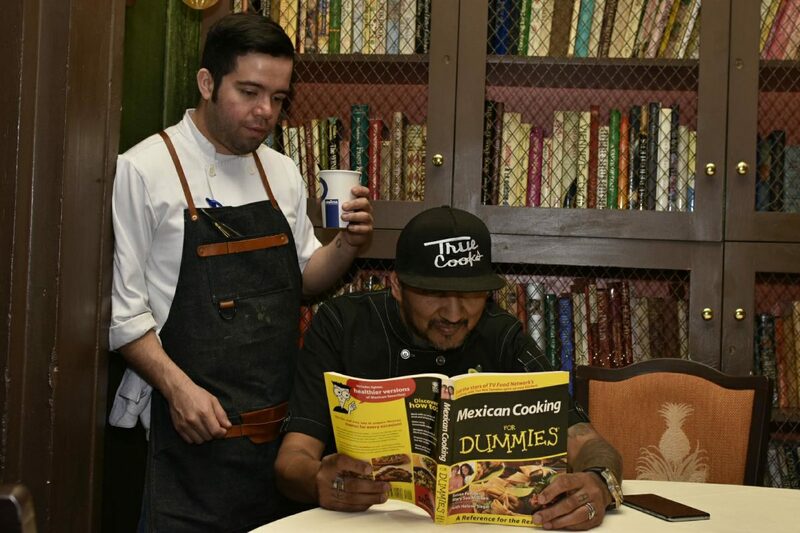 McAllen Chef Adrian Cruz, above, was chosen to prepare dinner Tuesday at the prestigious James Beard House in New York City. As customers file into the recently opened McAllen restaurant, Rock Ur Belly Speed Shop & Grub, a regular sits in her familiar seat — cast in a red glow, talking over blaring nostalgia from songs of the past. Elida Bautista Cruz comes to her sons’ restaurant after work and orders off menu. Because of health issues, Bautista avoids the homemade buns, gourmet burgers and potatoes fried in bacon fat. “They try to make something special for me,” Elida said of the fish, white rice or vegetable-based, low-sodium dishes. Her voice breaks and her eyes water speaking about her children. Elida turns 62 on Saturday, and when her son, Adrian Cruz, was planning his prestigious James Beard House dinner in New York City, he booked as close to that date as possible. 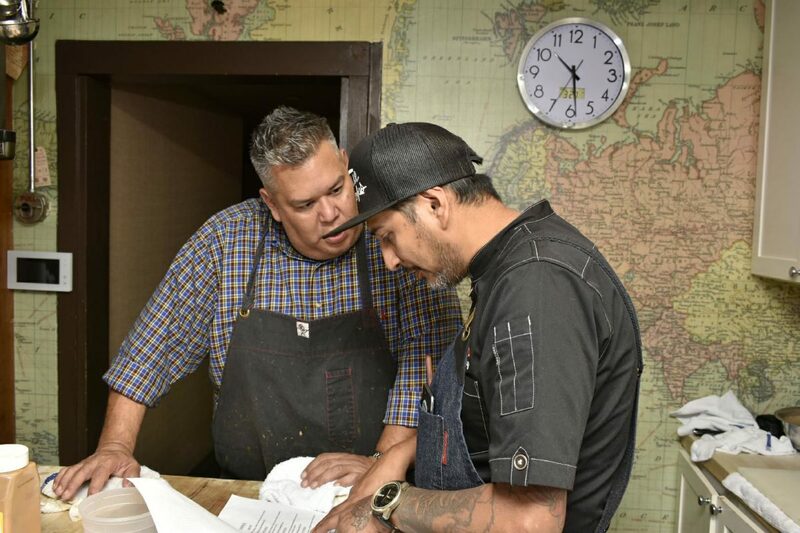 Adrian Cruz, right, and Paul Morales go over the menu for the dinner Tuesday night at the James Beard House. 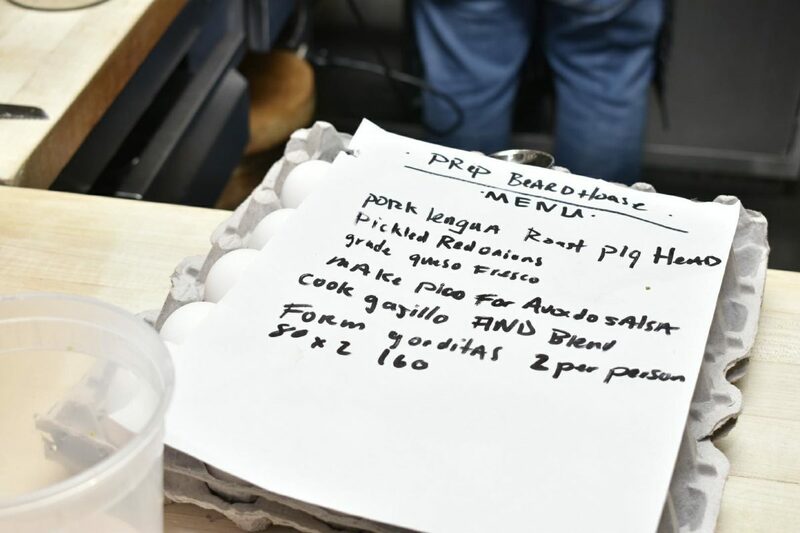 Some of the preparation instructions for Adrian Cruz's dinner Tuesday at the James Beard House in New York City. 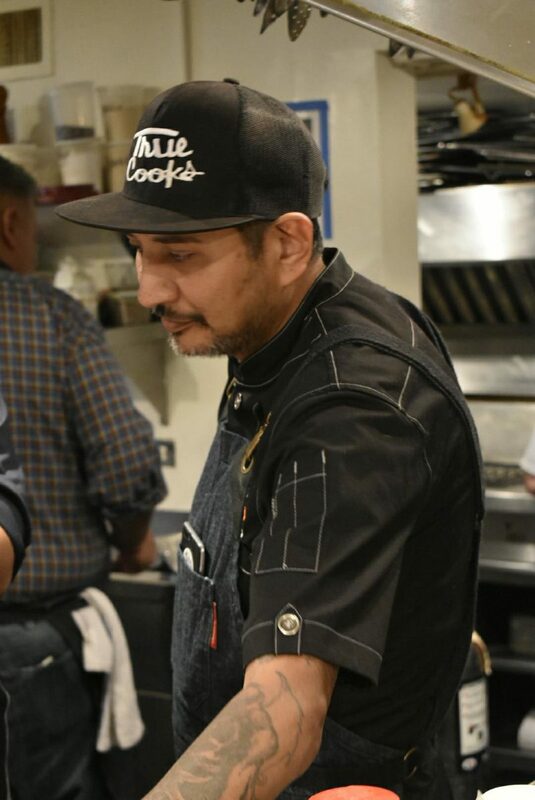 On Tuesday, Adrian Cruz prepared the dinner at the James Beard House titled “My Mother’s Migrant Kitchen,” which was “dedicated to the memories of when we were kids and focusing on the story of her,” he said. The James Beard Foundation is a nonprofit that celebrates and honors excellence in the culinary arts. About 200 chefs annually are invited to host dinners at the James Beard House. Elida Cruz joined her son on the cross-country trip. The Rock Ur Belly chef and his siblings started cooking by watching their mom work a makeshift restaurant to feed workers who harvested hops with their father. Living in Washington, Adrian remembers working the fields picking apples and grapes. Adrian said he was 13 when the family “left the migrant life” and came to the Rio Grande Valley. She remembers Adrian’s first dish was fideo. While her noodle soup was traditional with comino, garlic, salt and tomato sauce, she said he always experimented with different flavors. Fideo was on Tuesday’s menu in New York City, which featured “twist(s) on traditional dishes they were doing before, (but) having fun with the food,” Adrian said. He also crafted a pork belly pozole menudo and a duck-breast mole with chorizo fideo, a high-end take on his first creation as a kid. “He always adds something different,” Elida said. His flare for fusing flavors is what got the attention of the James Beard Foundation in the first place. Adrian was a winner in the 2016 JBF Blended Burger Project with his concha burger, which used sweet bread as buns. If you ask Elida, it started with her parents, and cooking was a communal activity because they had a big family. Her father would make barbacoa on the pit and her mom made tortillas. Adrian remembers his mother measuring ingredients with her hand. “‘What’s your recipe?’” she’s been asked. “This is my recipe right here,” as she points to her head. Adrian and his brother, Bobby Cruz, pride themselves on Rock Ur Belly serving customers that order off menu. And with the experience in the kitchen like their grandmother and mother before them, the brothers judge amounts by the weight in their hands and flavors by learned memory. One of the hardest parts of running a restaurant is trying to impart a specific cooking technique onto the staff, they said. Rock Ur Belly was born as a food truck, and was kept alive as a cooking competition team name and catering service. Car parts, skateboards, graffiti and candles decorate the spot. There’s a stage opposite the bar for live music. “I like rock-and-roll bars, don’t get me wrong,” Bobby said. “But I’d rather it be a restaurant that has rock and roll and not a bar that serves food. The concept is about giving people a taste of fine dining at a fraction of the price, Bobby said. And everything is made from scratch. Rock Ur Belly showcases the brothers’ eclectic dishes and fusion style. Appetizers include pork belly mac and cheese fried egg rolls, tempura chicken and bacon lollipops and ahi tuna watermelon tartare, which includes tamarindo and chicharron. They also serve salads, fish, a whiskey-infused ribeye and an espresso beef tenderloin. But the stars of the show are their burgers, fresh buns and fries. Various burgers include blends of beef, chorizo, slow-roasted pork, cheese sausage, smoked bacon, Canadian ham and more. They look to add to the menu when Adrian returns, and hope to have a healthy selection of milkshakes soon.